For the starters, the black N White cattle is not Jersey, it is Holstein Friesian. I don’t know why here in India we still call it Jersey cow? And later is of course our very own Desi Cow. Recently there was this viral video on whatsapp raising the debate over A1 milk and A2 milk. After watching it, many of my family members freaked out and started calling me. To be very honest this was not the first time I was hearing about it, have been following this topic since I was in the college (contrary to the popular belief, it’s an old debate!). Thus, without any further due let’s jump into it, shall we? What is this A1/A2 milk controversy anyways? After one major epidemiological study and series of animal experiments, back in the 1992, Dr. Elliot and his team of scientists from New Zealand made a starking discovery that there was a positive correlation between consumption of milk containing A1 β casein and Type I diabetes. The group also found correlation between A1 type milk and heart disease, arthritis etc. The debate started since then and now 25 years and a couple dozen studies later the scientific community is still divided on this topic! Milk, as we know is a great source of protein, right? There are 2 major milk proteins, Whey and Casein. Casein makes up to 80% of protein in cow’s milk. And β casein is one out of total 4 types of Caseins. Because of 1000s of years of genetic mutations, now 12 different variations of β casein exist. 3 out of which are well known and well researched. And those 3 are β casein A1, β casein A2, and β casein B. So when people are saying A1 or A2 milk, they are referring to the type of β casein it contains (β casein A1 or A2). Originally all cows produced A2 type of milk, and then happened genetic mutations with which came in A1! 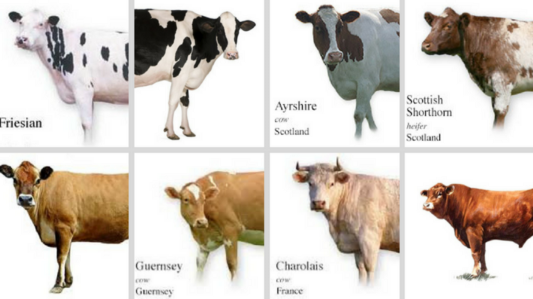 Throughout the world different breeds of cows can be found. Some of them possess pure A1A1 allele thus produce pure A1 milk. Some possess pure A2A2 allele so produce pure A2 milk. But some hybrid verities possess A1A2 allele and produce milk that has both A1 and A2 types of β casein! Is Desi Cow’s milk safe for consumption? Desi Cow (Zebu/Bos Indicus/Humped Cow) is found not only in India but also in Africa and has almost 75 breeds that are found throughout both Africa and South Asia. Of which 30 are found only in India. Wikipedia has a detailed article on Desi Cow Breeds. Zebu’s milk predominantly contains A2 type of β casein. Does that mean all foreign breeds produce the supposedly toxic A1 milk? Though there are 100s of varieties of milk cattle around the world, only a few are bred more and more due to their high milk yielding capacity. Out of those the top 4 ones are predominantly A1 milk producers (See the image 👆) and bottom 4 ones produce of predominantly A2 kind of milk! Why am I using the word predominantly repeatedly? Because no variety produces 100% A1 or A2 milk, not even Desi Cow! What is wrong with A1 milk anyways? A1 type of milk, when digested, produces a bio-active compound called β casomorphin 7 (BCM7). Step IV. have the results of the animal studies reproduced/repeated (because 1 experiment could be a fluke!). And get it reviewed by peers. Step V. Ultimately if possible, have clinical human trials and again get the results reproduced and peer reviewed! Scientific community has come up with this unspoken protocol to prevent any half-baked assumptions from becoming accepted as mainstream facts! That way just few observational studies (looking at demographic data and making correlations)or animal studies or any such isolated incidents could not be taken to form any radical opinions. I know.. i know, the whole process is longgg and takes years and years! And science always evolves (like dietary cholesterol was bad yesterday and today it is being exempted of all the bad rep! ), but always take a minute and do some research before making any radical shift! How well the evidence backs up BCM7 related Health Concerns? Type I Diabetes- Not Well, 3 observational studies backing it but 3 animal studies actually showing anti-diabetic and anti oxidative effects of BCM7 in mice! Heart Disease- Weak Evidence, 2 observational and one animal studies backing it, but 2 human trials that didn’t find any significant adverse effect of A1 milk on heart health. Autism- Weak and Conflicting Evidence, 1 infant study showing elevated levels of BCM7 in infants causing impaired ability to plan and perform actions. But several other human studies showing no evidence supporting the theory that BCM7 plays role in development of autism! Digestive System- Reasonable Evidence, 1 human study and 2 animal studies all showing evidence of A1 type milk causing inflammation of Gastrointestinal tract, causing delay in waste emptying and also softening of stools! Thus there is reasonable information out there to associate BCM7 and type A1 milk with digestive troubles. But as always, more research is needed! So there is some evidence for certain but not enough to ostracize A1 milk completely. Human Milk is 100% A2 (yet another reason to breastfeed), and so are buffalo’s and goat’s milk. Hence if you can find a Desi Cow’s milk near you, great! But if not then please don’t beat around the bush and grab some of buffalo’s milk. Remember any milk is better then no milk! And if worried about its high fat content, all you have to do is heat it up the night before and store it in the refrigerator overnight and next day skim all the milk fat that is floating atop. Easy-Breezy right? So to answer your question, is Desi Cow’s milk better than Holstein’s? I would say yes due to it’s high A2 β casein content! But does it have any miraculous disease curing properties? Sorry to say but none such proven yet! For more such stories and tips, stay tuned with us at DawaiBox Health Reads.